A nice day to crush Decepticons. 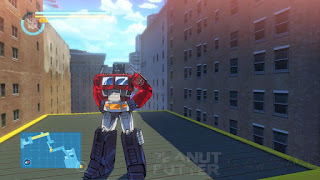 When I received the game, I noticed that it was going to be just playable as the Autobots. However, they give you 5 Autobots to choose from: Optimus Prime, Bumblebee, Sideswipe, Wheeljack and Grimlock. That's right, Grimlock. King of kings. 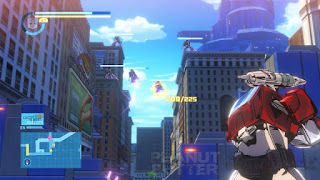 As an added bonus, many of the original voice actors have returned to reprise their roles, and may have been a deciding factor on which characters were put into the game. The story feels like something straight out of the original cartoon, or at least out of the comics. 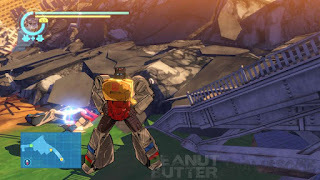 Megatron finds that the Plasma Energy core is hidden inside the Earth, and intends to use it to cyberform Earth into a new Cybertron, and the Autobots need to stop him. If this sounds familiar it is a similar plan as in the cartoon on the two-part episode "The Key to Vector Sigma". 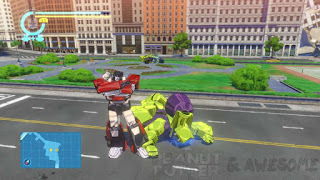 The game is centered around the current toyline, referred to as Generations, so it includes characters that either have a toy out in the Generations toyline or a Masterpiece figure. In fact, all the Autobots that you get to choose from, have a Masterpiece figure currently available in Japan. 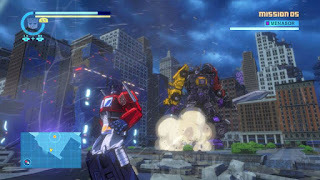 At first, you only play as Optimus, as you're shown the basics: how to melee, how to shoot, how to do vehicle attacks, etc. Once you've been familiarized with that, then you're able to choose between Optimus, Bumblebee, and Sideswipe. 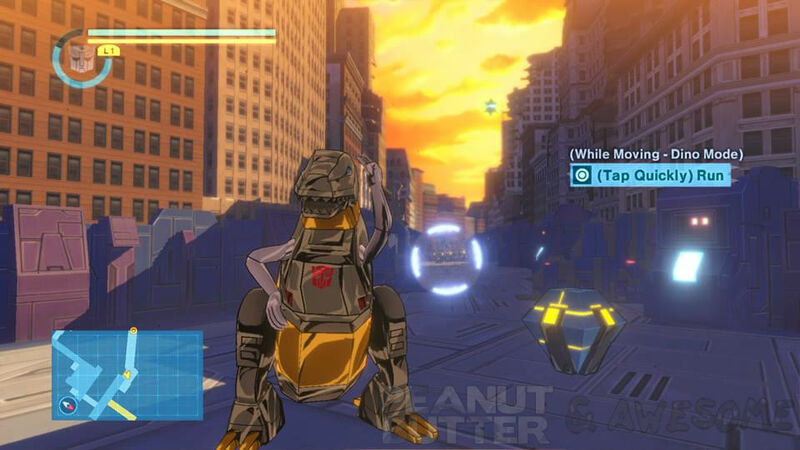 After a little more progression, you're able to choose Wheeljack, a little more progression and you can finally be Grimlock. As to be expected, each character has their advantages. Sideswipe is the fastest, so he's great when there are sections where you're outnumbered, Optimus is, well, Optimus. Well balanced and the character that most people will stay with because he's the most familiar. Bumblebee is good for one on one, when you need to get quick hits in and get out. Grimlock is extremely slow but is really powerful. Me Grimlock king. 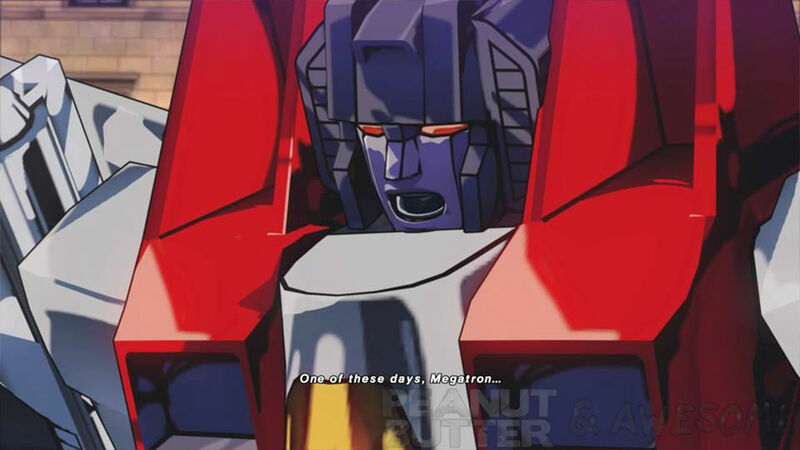 Not you, Starscream. The weapons can be customized by synthesizing them with other weapons that you get from item boxes or enemy drops. Certain weapons can only get to level 5, so you want to be careful not to use a rare weapon that has a higher max level with a common weapon. Of course, the weapons you start with don't generally max out very high, which is a bit of a bummer, because sometimes you want them to still have their iconic weapons, like Optimus' energon axe or his ion blaster. But, who can turn down replacing said weapons with, say, Menasor's sword, or Starscream's null rays? That's right, when you beat the bosses, you get one of their weapons. Prime told me there'd be days like this. To get a good feel for the story and gameplay, I played on the easiest mode. From the beginning, there are 3 difficulties, but 2 more are unlockable. Just playing right through, without going too much out of the way for collectibles, it took me about 6 hours. However, considering all the extras you can unlock, there is way more to this game. While playing, I saw what, at first, was a firefly, but as I got closer, I realized what it was and it brought a tear to my eye. Once I was close enough, I could hear the familiar cry: "Kremzeek!" If you manage to grab the Kremzeek (which is not an easy task by any means), you unlock something in the galleries in the extras section. Sometimes, while looking up (because who doesn't randomly look up when they're trying to save the Earth) you'll see Lazerbeak flying in circles. If you shoot him, you unlock something in the galleries section. You'll also notice the Decepticon logo floating in the air. Yup, more things for the galleries. There's also mystery logos to collect that unlock something in the galleries. The Galleries section has level art, character art, character models, and Generations art. There are also additional missions in some of the levels to get more weapons. The music was great. They got Vince DiCola, who composed the music for the 1986 movie, to compose music for the game. 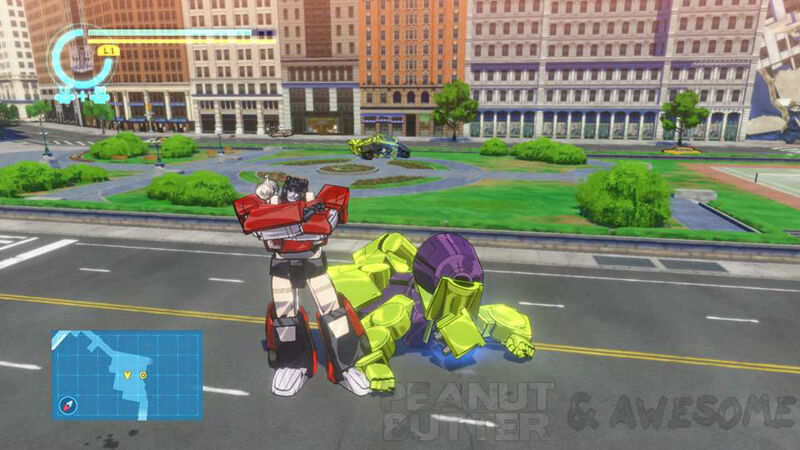 It gives you that 80s feel that every Generation 1 themed Transformers series should give. When you're in a boss battle, the music is very 80s metal. Now that's what I call devastating. Speaking of boss battles, they were epic. Since the game is focused heavily on close combat, you need to be very careful while attacking. You are warned when they are attacking, so evading is crucial. Evade too early, and you risk getting hit, depending on their reach, or the type of attack; too late and you'll definitely get hit. But evade at just the right moment and you trigger a Focus Mode, which is only activated for a short time. This allows you to get some hits in before they're able to react. If your attacks are fast enough, you maybe able to get a combo in and use your vehicle attack. Straight to the moon, Megatron! Now, I know what you're thinking. "You're going to give this a perfect score, aren't you? 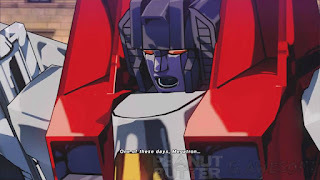 You're probably so in love with Transformers that you're going to say that there's absolutely nothing wrong with this game." To that I say, challenge accepted. No, this is not a perfect game. I have a hard time believing that there is a single game without it's flaws. But, this isn't about other games. 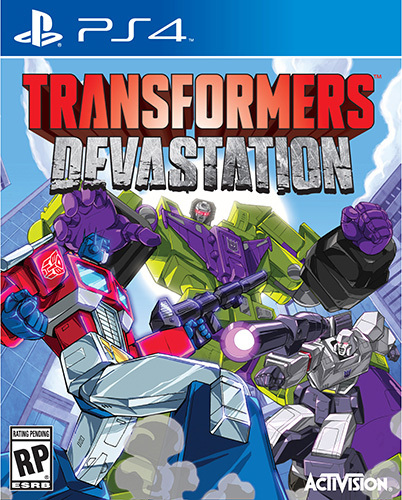 This is about Transformers Devastation. Personally, I feel like they robbed us of what would have been an extremely fun online experience. I think giving people the option to battle their friends or random people using the weapons they worked to increase would have been great. 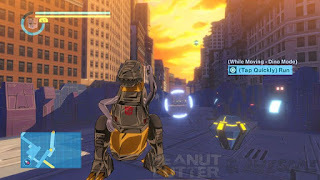 They could have made that the mode where you could play as a Decepticon if you wanted to. I mean, sure it has a lot of replayability, but it would have been great to prove that you're the toughest Autobot or the baddest Decepticon. Hey freakshow, what're you doin' up there? Another thing that bothered me was how scarce ammo was. To be honest, I'm not sure exactly how you earn ammo. 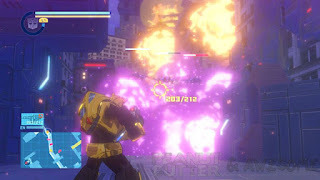 It seemed like sometimes I would get ammo back when I destroyed a Decepticon, but then sometimes I wouldn't. I understand that they want you to melee as much as possibly, but when you're fighting the seekers or anyone else that can fly, it can be annoying when you run out of ammo. Especially when they're on top of a building. I mean, really? 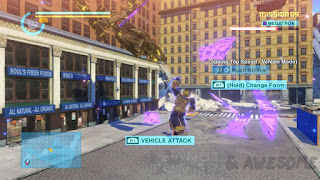 There are some side missions that require that you destroy a bunch of these floating item boxes, but if the weapon you have doesn't have enough ammo because they're moving too fast or you have terrible aim, you have to just wait for the time to run out, because either the boxes are too far away or they're up in the sky. 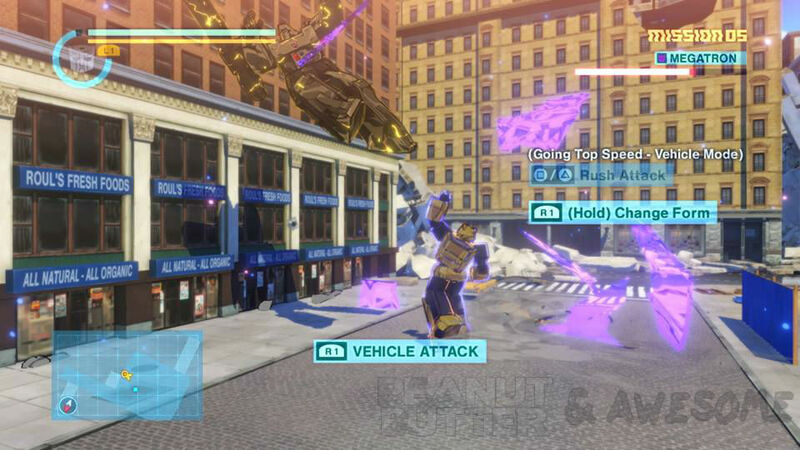 While we're on the subject of extras, there are 2 missions where you have to beat a Decepticon in a race format that leads to a fight. In these missions, there are hidden collectibles like Kremzeek or Decepticon logos, etc. It would make sense that if you beat them up, the race should be off and you should have time to explore for extras. Sadly, this is not the case. You just knock them out briefly. I found this ou while trying to catch a Kremzeek while racing Motormaster. I beat him up and then noticed Kremzeek bouncing around. I tried to catch Kremzeek and then suddenly I was given a Retry screen because Motormaster woke up and beat me to where I needed to go. Me Grimlock think me should have switched out. Lastly, it would have been nice to be able to switch characters at the beginning of the mission. Sure, they let you switch out when you find the green circle with the Autobot logo, but you don't always know what you're up for. 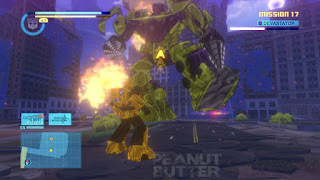 For example, that race with Motormaster, I was playing as Optimus. Had I known that I was about to race, I would have switched to Sideswipe. Sometimes you just want to fight certain Decepticons as a certain Autobot, Grimlock isn't built for speed, but some of those boss battles would have been smoother if I had him right before the fight. All in all, with the good and the bad, I was very happy with this game. Sure, it may have missed out on being an amazing multiplayer game, and there were a few minor frustrations, but the combat is great, the music was awesome and totally fitting, and the replayability is great. Sure, I beat easy mode in 6 hours, but who knows how long the harder difficulties will take. Plus, there's always side missions that need doing. That is why I give Transformers Devastation a 9/10. Transformers Devastation is available now for PlayStation 3, PlayStation 4, Xbox 360, Xbox One, and PC.